Limited Space!! Grab your spot by registering here. present "Moving Our Stories: Erasure, Resistance, and Survival"
Contributors to the first five issues of The Dancer-Citizen were invited into a collaborative process with the journal toward the development of this live, curated event, with the aim of more deeply exploring themes generated by the journal issues. Hosted by editor Julie B. Johnson in Atlanta, and with live feed originating from New York City and Los Angeles in the US, and Hamburg, Germany, MOVING THE MAP will invite audiences both on-site and on-line to performances, workshops, and discussion. Sequential scheduling will allow audiences to move among events or stay engaged with one site; the full event can be re/visited via the journal archive. For further details and to see previews of collaborating artsits' work, visit http://dancercitizen.org/moving-the-map/ . "Moving Our Stories: Erasure, Resistance, and Survival," is supported by the Alternate ROOTS Artistic Assistance Program grant, made possible by funds from The Nathan Cummings Foundation, The Ford Foundation, the Surdna Foundation and The Andrew W. Mellon Foundation. Did you attend this event in person or via the livestream? Please share your feedback!! 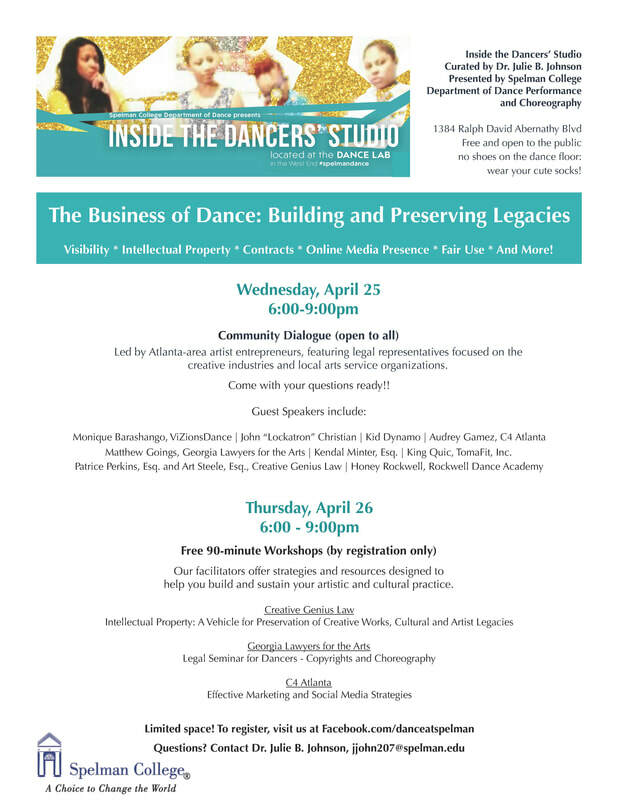 "The Business of Dance: Building and Preserving Legacies"
​Registration is required for the workshops. This 2-day symposium will focus on entrepreneurial and legal strategies to help dance practices thrive. The event is free, but registration is required for the workshops. Moving Our Stories explores how memory lives and move in our bodies. 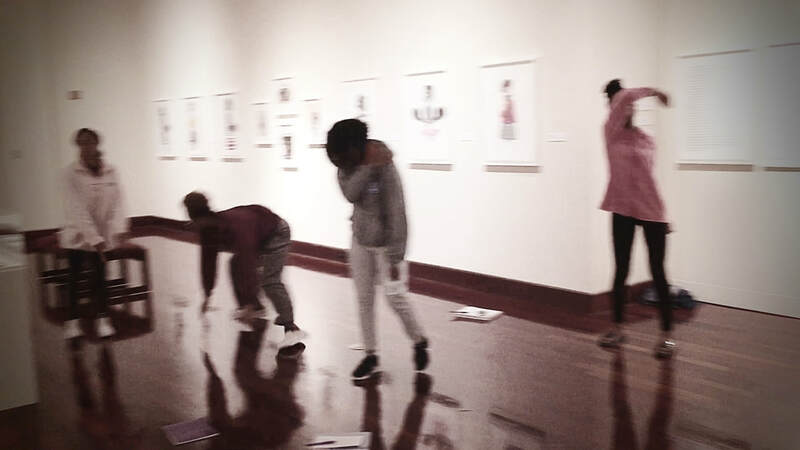 Accompanied by Okorie Johnson (OkCello) and a group of multifaceted dance artists, Join us as we move through Deborah Roberts: The Evolution of Mimi and find connections between her art and our own physical realities. This Moving Our Stories workshop is supported by the Alternate ROOTS Artistic Assistance Program grant, made possible by funds from The Nathan Cummings Foundation, The Ford Foundation, the Surdna Foundation and The Andrew W. Mellon Foundation. featuring: Tambra Harris, Nneka Kelly, and Kalah Byrd. StoryGround… a dance collective, contributes a movement meditation on erasure and survival - an interactive performance within Charmaine Minniefield's art installation. ​Contemplating parallels to Ring Shout rituals and Gullah-Geechee communities (whose existence is a testament to survival amidst the rapid and widespread impact of gentrification and cultural erasure) the core question, “what does it mean to erase/to be erased?” provided a guiding prompt for our movement exploration for Minniefield’s work, “Remembrance as Resistance: Digitally Mapping the Ring Shout.” Stories of ‘erasure’ - whether an act of eradication or remnants of the past that mark our survival - illuminate what lingers in the face of displacement or destruction, and how collective memory can serve as a practice of survival and empowerment. We strive to honor past and present Ring Shout practitioners by acknowledging that we are not performing a traditional Ring Shout. We navigate its history and traditions in the context of contemporary dance forms and African Diaspora movement aesthetics. This work is part of Johnson's "Moving Our Stories: Erasure, Resistance, and Survival," supported by the Alternate ROOTS Artistic Assistance Program grant, made possible by funds from The Nathan Cummings Foundation, The Ford Foundation, the Surdna Foundation and The Andrew W. Mellon Foundation. 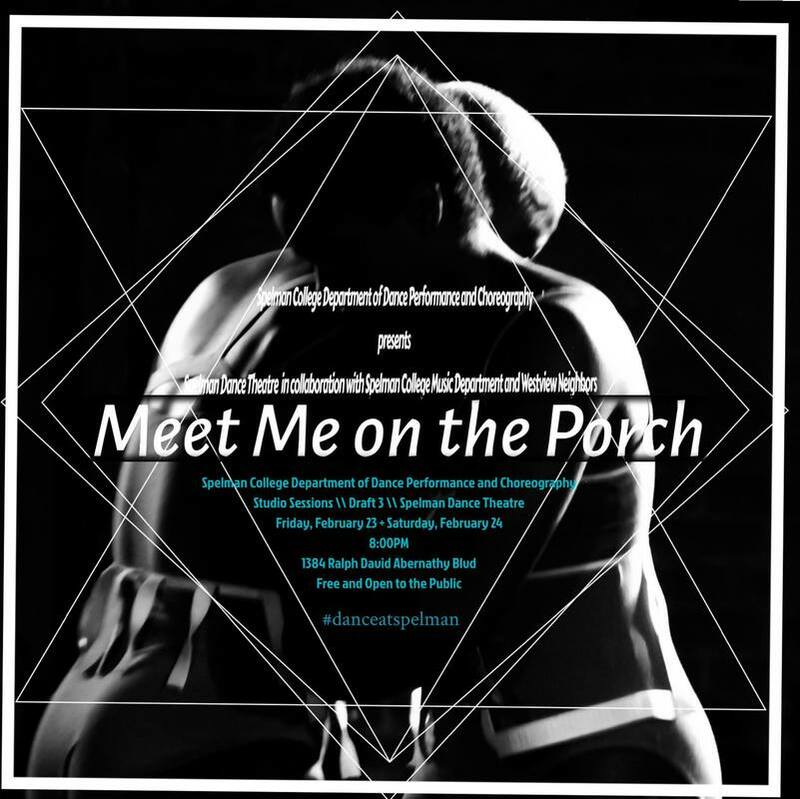 Spelman Dance Theatre's "Meet Me on the Porch"
​Following 8 months of research, rehearsals, and drafts, Spelman Dance Theater will premiere Meet Me on the Porch on the front porches of three South Gordon Street residents. For this final iteration, Spelman has teamed up with David James, professor of computer science at George Washington University’s School of Engineering and Applied Science, to create software that generates sound in real time. James developed this movement-tracking software for iPhone and Android, and the dancers will wear their smartphones throughout the performance. Inspired by the bell tones of sound healing rituals and blended with ATLien frequencies, the sounds (created and mixed by Dr. Simon and his students) will be triggered and amplified by movement. Atlanta-based fiber artist and costume designer Grace Kisa created spring knits in the spirit of rejuvenation, freedom, and rebirth. Each costume has a custom pocket on the arm for the dancer’s smart phone. 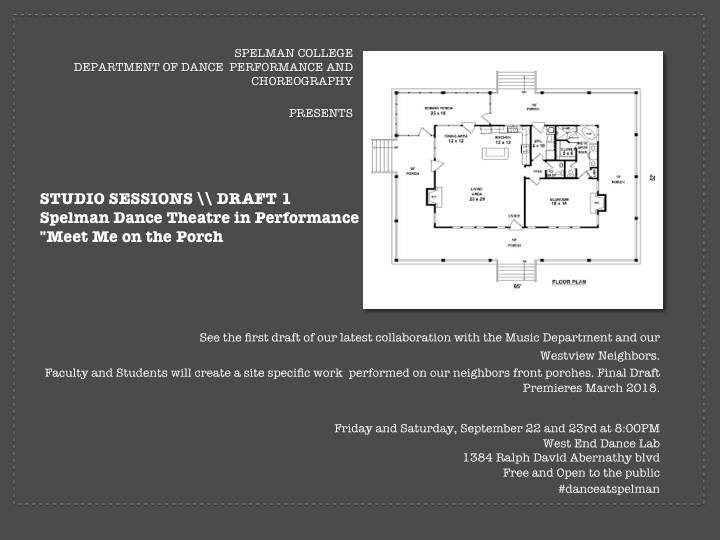 Spelman Dance Theatre's "Draft 3 \\ Meet Me on the Porch"
Spelman Dance Theatre and neighbors in the West End. 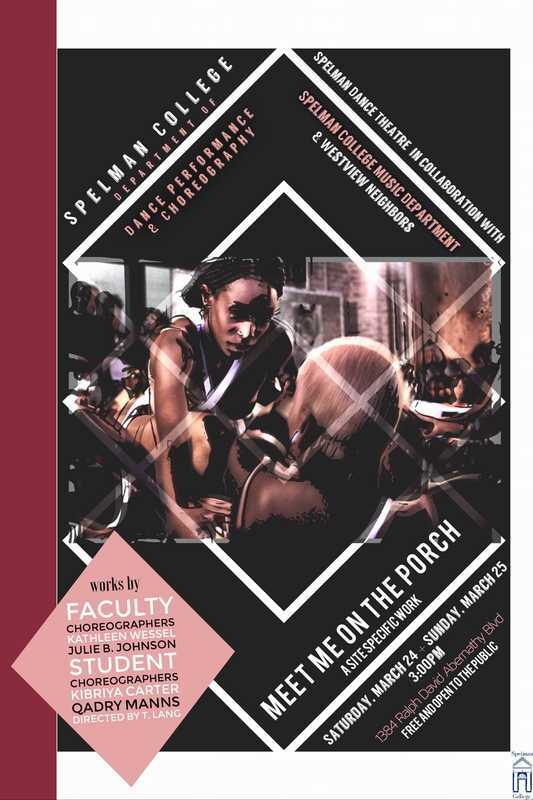 from the Spelman College music department. 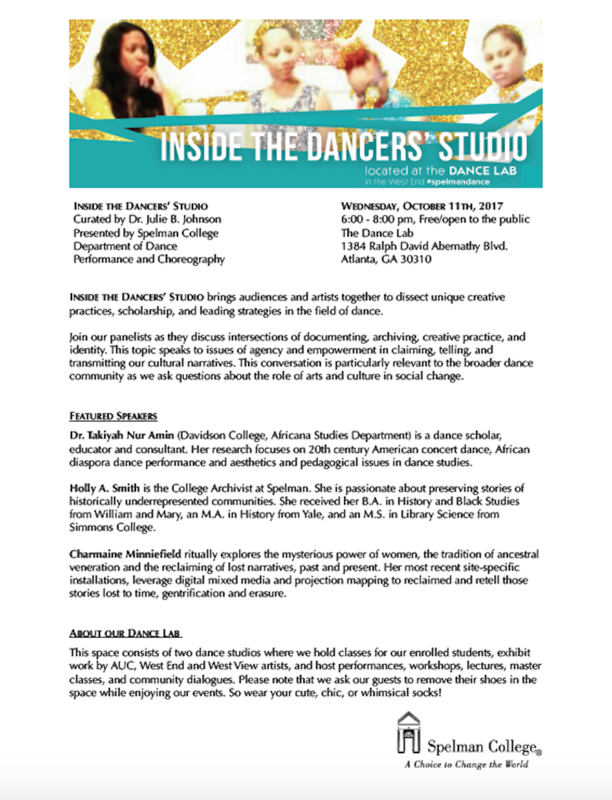 Spelman Dance Theatre's "Studio Sessions // Draft #3"
Inside the Dancers' Studio brings audiences and artists together to dissect unique creative practices, scholarship, and leading strategies in the field of dance. "Moving Our Stories: The Embodied Memory of Ruins, Erasure, and Survival" is an interactive movement conversation that explores embodied memory, histories, and narratives. 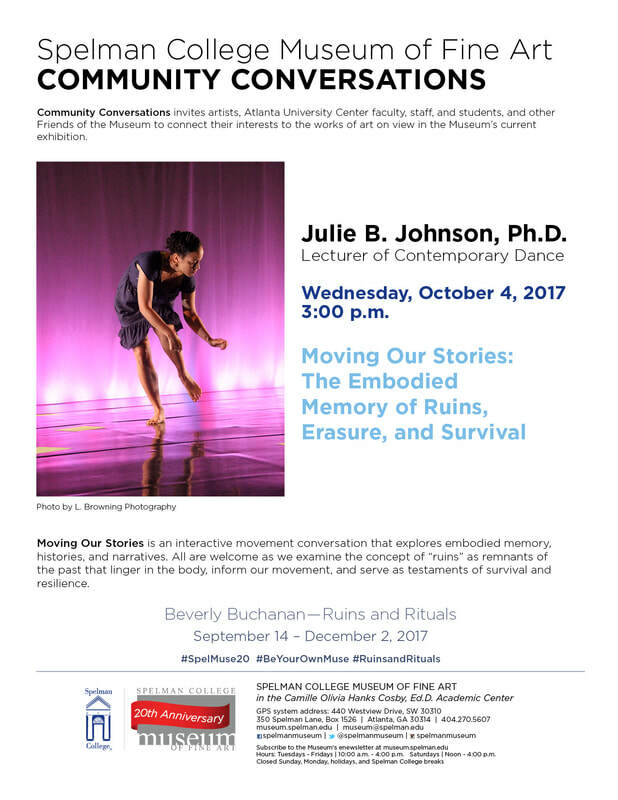 All are welcome as we examine the concept of "ruins" as remnants of the past that linger in the body, inform our movement, and serve as testaments of survival and resilience. 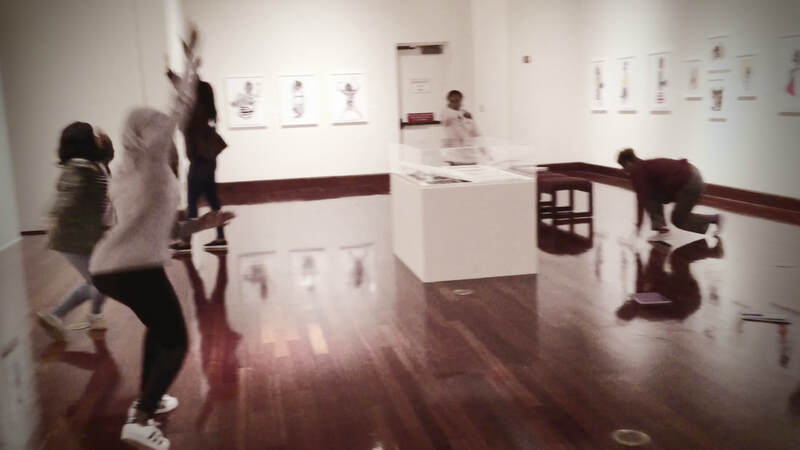 Community Conversations invites artists, Atlanta University Center faculty, staff, and students, and other Friends of the Museum to connect their interests to the works of art on view in the Museums's current exhibition. 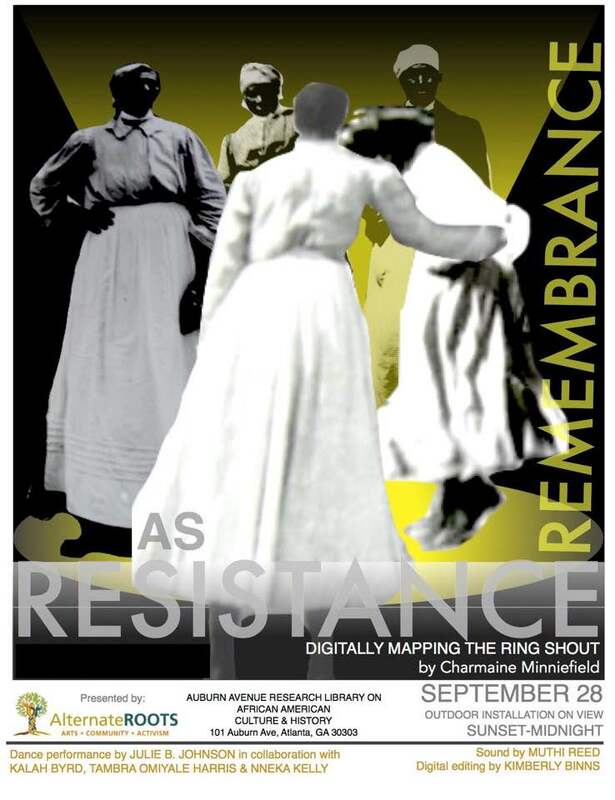 "Remembrance as Resistance: Digitally Mapping the Ring Shout"
Choreography by Julie B. Johnson in collaboration with Tambra Harris, Nneka Kelly, and Kalah Byrd. Part of Alterate Roots' "Roots Weekend"
Spelman Dance Theatre's "Studio Sessions // Draft #1"
$12 single class; $10/class when you register for all three classes. 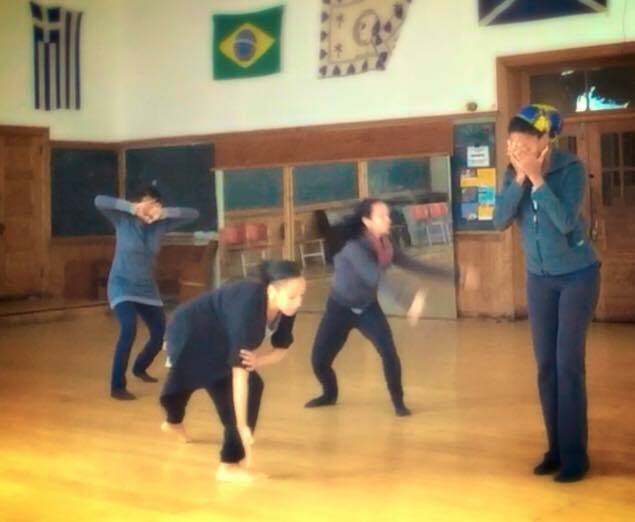 This contemporary dance class emphasizes African Diaspora movement aesthetics, drawing on West African dance forms, jazz dance, and hip hop forms. An upbeat warmup gets our energy percolating while we find fluidity in our spines and buoyancy in our limbs. Through center technique phrases and progressions across the floor, we dig into strength, balance, and, precision - we play with propulsion and expansive use of space. In our choreographic phrases, we explore our unique body rhythms, percussive flow, and dynamic energy shifts. 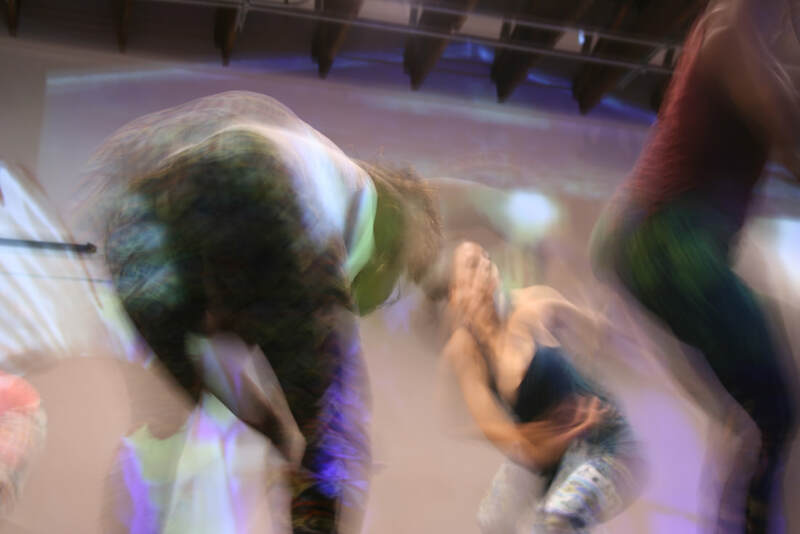 "MOVING OUR STORIES: EMBODIMENT, DANCE, & SOCIAL JUSTICE"
Moving Our Stories explores relationships between embodied processes and social justice activism. In this interactive presentation, Johnson will introduce participants to Dancing for Justice Philadelphia (DFJ Philly), a local initiative coordinated by Lela Aisha Jones and a diverse team of collaborators as part of a national multi-city DFJ movement to honor Black lives lost to police violence and creates spaces to convene around racial injustice. She will engage participants in a multi-modal embodied storytelling practice that begins with sensory exploration and body memory as an effort to build empathic connections between individual and collective experience, and demonstrates intersections of embodiment and social justice practices. This event is part of Re-Place-ing Philadelphia, a project of Painted Bride Art Center that uses the arts and public dialogue to bring seemingly invisible cultural memories to light and enrich our city's history. Visit www.re-place-ing.org for more information and to share your Philadelphia story. Re-PLACE-ing Philadelphia has been supported by The Pew Center for Arts & Heritage.